Christmas updates will come soon but first I had to share our laughter this morning. One of my best buds has recently started juicing. Think juice machine, fresh fruits and veggies, and amazing for you. Not store bought concentrate. I’ve been juice curious myself and went for a visit yesterday with my refrigerator full of veggies in tow. Two jars of juice came home with me. So. Delicious. Seriously. I’m finishing off a beet and carrot juice as I write. The very beet and carrot juice I had to run and hide to drink because my awesome food-loving toddler kept stealing it from me. You see, he only drinks water or milk and has only ever had apple juice twice in his life. He didn’t really like it much either. 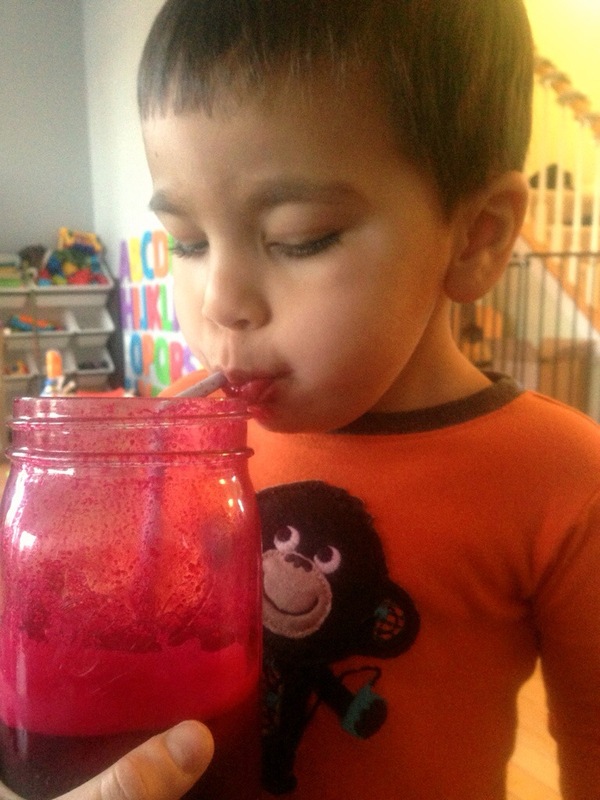 Beet juice is a totally different ball game. I went to a restaurant with him that served juice recently and he drank more of my juice than he did the “special treat” chocolate milk he and his friend were splitting. I had forgotten all about that until this morning. 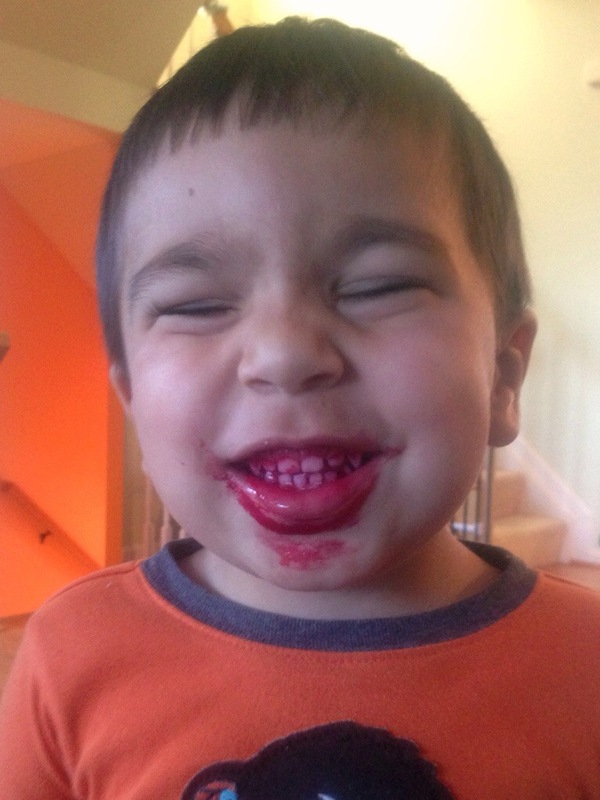 Out comes *my* beet juice and over runs my toddler, literally wagging his tongue to try it. He chugged and chugged and chugged the juice then smiled that cute bright fuchsia smile of his and asked for more. I shared but eventually had to run and hide since this is my breakfast today. I’m so proud of this little dude’s food choices. Don’t get me wrong. Like any toddler, he asks for cookies if he sees them but apples are more frequently requested. 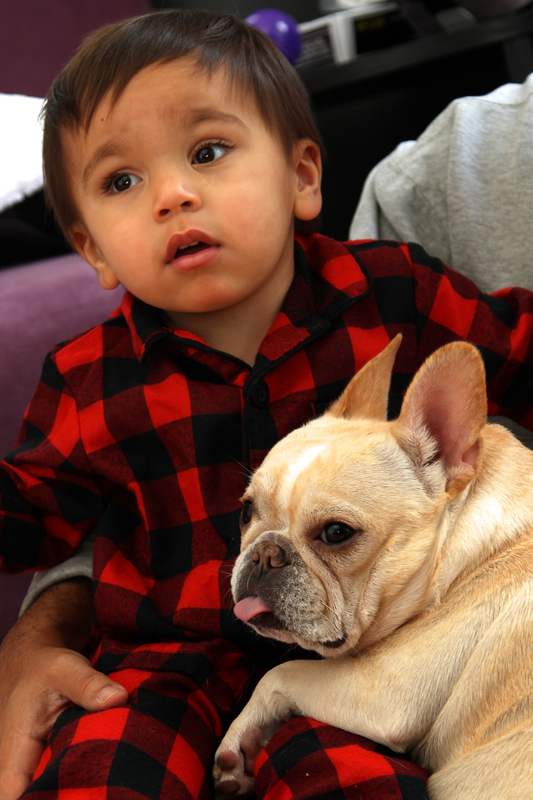 Check out these juice boy photos and giggle with us. Kamran’s 2nd “not birthday” as I call it has come and gone. This year was a little easier to get through the anniversary date of my water breaking so prematurely. I didn’t quite dwell on the scary experience as I did last year, but spent the day rather thankful. I think my mind is healing from the trauma of it all. That or I’ve pushed it further back in my mind. My hospital experience–while not something I EVER would have asked for–has certainly grown me as a person. I learned to advocate not only for myself, but also my family. Something new parents don’t realize as necessary right away. My tiny hat business stemmed from the encouragement of others to keep me busy while in the hospital and it’s growing! Kayvan and I also met some truly wonderful people and made some really great connections we would have otherwise not met. Of course, that meant they were either in the same crummy situation as I or caring for the patients I have come to call friends. I still keep in touch with some of my nurse friends. As a matter of fact, we delivered bagels to the hospital on the 23rd and got to visit with the select few nurses working during the holiday time. We plan to keep up with this visit each year. We also stop by whenever we are at the hospital for appointments but that is becoming less frequent, thankfully. Which leads me to one of my internet pals. We were admitted to the hospital at relatively the same time with completely different complications, in different countries even. Our boys are 2 days apart. Like all of my friends from this different hospital world, she gets it and is a text away if I need her. Another friend from the HRP unit moved out of state. Our kids were also in the NICU together. Before her family moved, we would meet for weekly walks post-hospital life. She and her husband recently opened a store in their new hometown. It’s adorable. The sell mostly handmade items like reclaimed barn furniture…and my hats. When Kamran was in the NICU, our hospital only allowed parents to visit–not grandparents or any other relatives. This means that our HRP friends whose babies were also in the NICU got to meet Kamran before our own family did. With family not having the ability to get to know our son or even meet him until 1 month old, it means a lot to have friends who got to meet him as a newborn. Reflecting on the 23rd, I realized that everything really does happen for a reason. I knew it all along. I’m glad it all worked out in my favor eventually, even though I had to serve some crummy time “on the inside” as I once called it. Since 12/23 fell on a weekend this year, we had some quality family time in the morning and visited the hospital with bagels, put Kam down for his nap and then visited friends to Celebrate for the holidays post-nap. Now that Kamran is 2, he is quite caught up with all of the non-preemies and I’m much more at ease with all of his developmental milestones. He is starting to string words together and is also a great eater–thankfully! I’m not sure how much longer into toddlerhood the eating thing will last but I’m sure “NO, MY DAT!” will stick around for quite a while. We spent Christmas Eve and Christmas day with family of course, and the week in between Christmas and New Years on vacation with friends. Kamran is one cool, easy going kid. I love this boy and he was worth every moment laying in that hospital bed. One thing I never doubted. Here are my two favorite snuggle bugs on Christmas Day. My blogging has died off since my hospital days. Guilty. I am still crocheting like crazy though! Lately I have been asked by several of my Facebook followers if I make adult items. I DO! 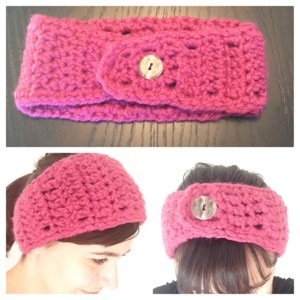 Check out this chunky headband. The item is also here in my Facebook gallery. Outside of pie, I’ve never really eaten pumpkin as part of a meal. I made pumpkin purée with cinnamon for Kamran when I was making him baby food last year and it was one of his favorites. It’s almost fall again and pumpkins are back in the produce department at our grocery store. So I needed to figure out a pumpkin recipe I could make for the family which both Kam and Kayvan could potentially eat. 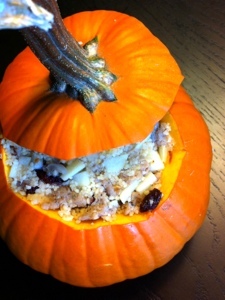 A friend on Facebook posted that she was making stuffed pumpkin–and there I found my answer. The recipe she posted was rather meat intensive and finished off with bacon. I wanted something more fruity, below is what I came up with. Slice off the top of the pumpkin, remove seeds and strings. Melt butter and lightly coat the inside of the pumpkin. Sprinkle inside with cinnamon. Remove sausage from casing and sautée with onion, drain. Mix in diced apples, cranberries and cous cous. Stir all ingredients together and stuff pumpkin as tightly you can. Replace top, place in baking dish with 1/4 inch of water on the bottom. Bake 1 hour and 15 minutes or until pumpkin can be pierced through with a fork. To serve, cut in quarters. I’ve been MIA for quite some time. SORRY!! Summer fun and all that jazz! Now that Kam is a toddler getting out is the thing to do!! 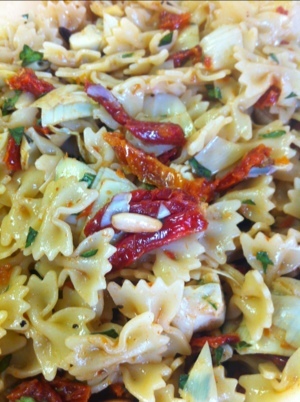 I got a hankering for sun dried tomato and turned it into a yummy recipe I thought I would share. IT’s so super easy to make too. Cook the pasta. 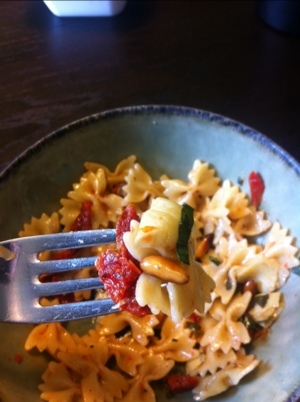 The beauty about mini pasta is that it cooks quickly. Roast pine nuts in oil (optional). Mince basil and cut artichoke in bite size pieces. Add all ingredients, stir and refrigerate until chilled. We will be taking this for lunch a few times this week. Yummy! I didn’t know the definition of the word furlough when I first entered the work force. I’m not sure how I escaped SAT prep or college without that piece of knowledge. My first job out of college was for a newspaper company so I learned the definition. I still work for the same company, though I have changed roles a few times so I’m furloughed this week. Furlough is mandatory unpaid leave for those of you who have heard the word but never needed to look it up, much like I experienced. This makes me a temporary stay at home mommy for the week! I know, I know. One week is hardly a taste of what it is like to be a stay at home mom but I’m really looking forward to spending quality time with my little man. On my first day of furlough two amazing things happened. Kamran slept in…and my alarm didn’t go off. Now if that happened on any ordinary Monday in our house I would be a horrible, rushed, grumpy mess. Today, I was well rested and happy. In fairness, Kamran did wake at 4 am but that’s still semi-normal in this house so it’s no big. Back to the daycare thing. Kamran only spent 2 days at daycare last week so I want to make sure he doesn’t forget what it’s like. Besides, I still have to pay whether he goes or not. So go he did. Though I took him in late and Kayvan brought him home early. Of course, I had planned for Kayvan to drop Kamran off at daycare per usual so I could just clean. Since Kam slept that didn’t happen. I also didn’t stick to the rest of my plan. The grocery store is across the street from daycare so I made a grocery run. As I was leaving the grocery store I made a last second right turn into Target (with its evil red eye) and bought a new steam mop. I was planning to clean today after all. The thing is AWESOME. However, this is a week of unpaid leave so I hang my head in shame. I guess after spending 6 years together Kayvan’s impulsive ways are rubbing off on me just a bit. But did I mention the steam mop is AWESOME?! I vow to clean my hardwood floors once a week. We all know that vow will quickly be forgotten, right. So I started the first furlough day off financially in the hole but my floors are clean, so is the top floor of my house. Kamran’s clothes that are too small have been sorted, folded and put away as well. Organizing things tends to be a time sink for me so perhaps I’ll clean tomorrow during nap time. Kayvan got home early with Kamran. We grilled sausage, zucchini and corn. Kamran didn’t touch the zucchini but ate close to an entire ear of corn. Our neighbor stopped by for a few minutes to chat afterward so I let Kamran finish drinking his milk on the floor and out of his highchair, something I normally don’t do. That’s when another really awesome thing happened. Kamran decided to walk. Like really walk! Not 3 steps and sitting in a very controlled manner. He took 8 whole steps. Then he realized what he was doing and decided it was a really bad idea–because, you know. He wants to be carried for the rest of his life. Keep your eyes peeled for tonights incredibly exciting update about Furlough Day 2. Kamran visits the cardiologist (hoping for good news) then my step sister, Nikki. Since I’m home today, Kamran and I shared our snack. We had strawberries and cottage cheese. It was super quick, easy, healthy and filling. I never liked cottage cheese until recently. Before you say “Ew that stuff is gross!” like I used to, I encourage you to try organic cottage cheese. I promise it tastes good. I agree that non-organic cottage cheese is naaaaaaasty. This is more a suggestion blog than recipe since it’s so simple. 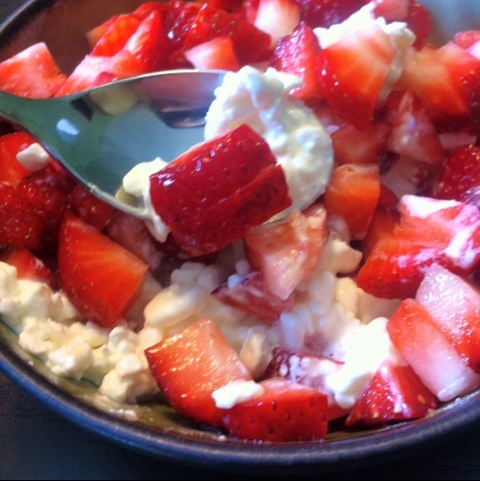 Add diced strawberry to a few scoops of cottage cheese, stir and enjoy. For those of you who haven’t done strawberries with your little one yet you can really substitute any fruit. As a working first time mom I am always looking for any good advice that simplifies my life and makes me more productive. Adding the ability to look good while I’m at it is a bonus. Today at work one of my colleagues sent an e-mail to me and another co-worker with some beautification tips. The subject was “Solving Your Problems.” The advice within was simple. Common sense even. I laughed hysterically after reading so I figured I would share her words of wisdom with those of you who, like me, have an almost 1-year-old (or any aged child for that matter) who still does not sleep through the night and may need to cover those circles. Yep, January 12th has come and gone again! I’m one year closer to 30 and am officially beginning to dread that number. I have friends who are over 30 and they seem to have survived okay but I’m not sure I can take it. So, if I tell you 5 years from now that I’m 29, just pretend I’m not fibbing. Besides, Kayvan will always be older than me! Okay, onto the birthday wish! I my friends and family to walk with us in the March for babies on May 6th this year. if you can’t join us, a donation will make that absolutely forgivable. Why is the March of Dimes so dear to me? To start, my grandmother had polio years and years ago. What many don’t know is that the March of Dimes was founded to cure polio. It was their research and trial vaccine that cured my grandmother and helped her regain the ability to walk. When I went into labor prematurely last year, magnesium stopped my labor and helped me stay pregnant. The knowledge that powered my high-risk prenatal care is courtesy of research done largely by March of Dimes. When Kamran was born at 35 weeks and was in the hospital, the March of Dimes was an invaluable support system for me, Kayvan and Kamran. We don’t really know why my water broke so early but the March of Dimes is researching early preterm labor and the answer to the questions surrounding that issue will help hundreds of thousands women who may one day be in a similar situation to the one I was in. On a larger scale, the March of Dimes and their research helps millions of babies daily and most don’t even know it. This morning I was thinking about all of the stuff I need to get done before 2012 shows its face. I realized, I have a large list of do-good type items and thought I would share them with you. That way, I’m held to my deadline. Visit the hospital with goodies for HRP and Labor and Delivery patients and staff. Donate the mountain of clothes in my house. Donate to the March of Dimes. Donations in December are being matched by the board of trustees, plus my company will match as well. One random act of kindness. Chop off and donate my hair. I’m going to need extra time for this one. I think I look better with short hair. I’ve grown to really like my long hair though. Maybe I’ll cut it for my birthday in January…or Kamran’s in March. I’ll try to track my progress and send out occasional updates. 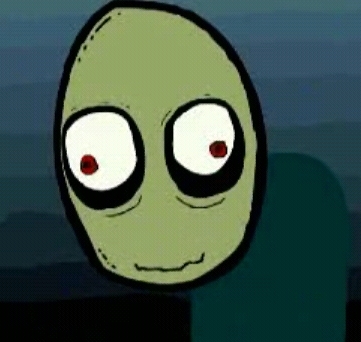 So tell me…do you have any good deeds planned? Does anyone want to volunteer with me somewhere? Last Christmas a group of friends and I decorated the children’s ward at a hospital in DC.